Goldenrod tea is the warm, deeply golden color you would expect from brewing this gold-yellow flowers. Mild with a slightly bitter aftertaste, goldenrod tea tastes good with just a bit of honey. 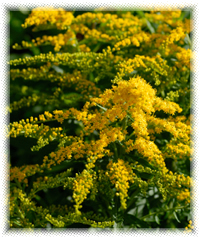 Goldenrod's main action is on the kidneys, as one of the safest and most effective diuretic-antiseptic herbs used in treating in treating bladder infections and kidney stones. Recipe Instructions: Herbal Tea :Use 1 to 2 teaspoons for each cup of water. Pour hot water over herb and let it infuse, covered, for 10 minutes. Drink warm between meals.